Elisabeth Fraser was diagnosed with type 1 diabetes at age 28, but that hasn’t stopped her from continuing to explore the world! Elisabeth and her husband currently live in Tanzania, where she teaches at an international school. 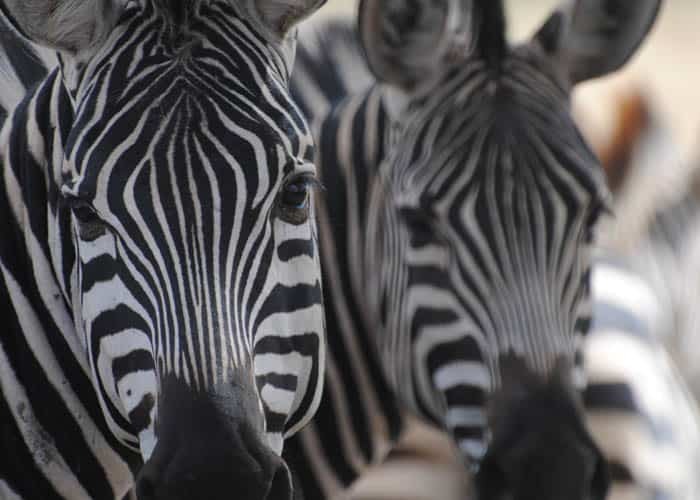 Wildlife sightings and incredible landscapes are only the beginning of her story with type 1 in East Africa. 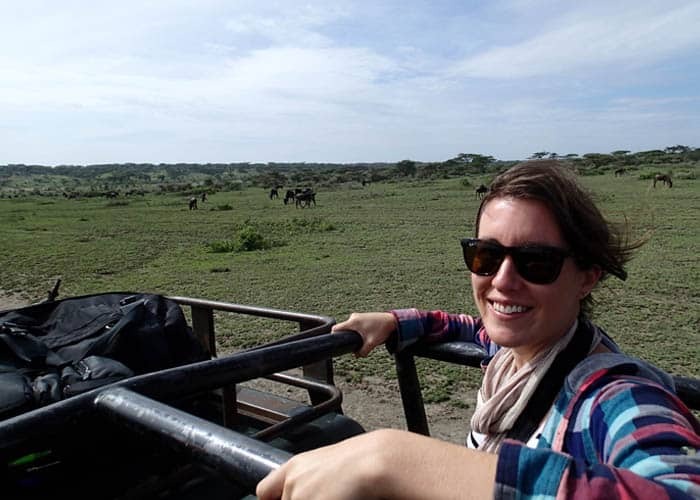 Below, she talks about living far from her native New Zealand and what it’s like checking her blood sugar in not-so-usual places, like high above the Serengeti. Can you tell us about your type 1 diagnosis and how diabetes is approached in the healthcare system where you live? Actually, I was living in Australia when I was diagnosed. Luckily, we have an amazing reciprocal health care system [with New Zealand]. At the time I was teaching in a public school, grade 1. I had just accepted a teaching job at an international school in Tanzania and resigned [from the school in Australia]. For my last 6 weeks of work I was just exhausted, weight loss, all the usual symptoms. I saw three doctors who all prescribed me different antibiotics, despite me crying about how thirsty I was! Eventually the final doctor listened and I was diagnosed. The care I received in Australia was incredible. [There was] so much support and everything was fully funded by the public healthcare system. The best thing was there wasn’t a single doctor or nurse who discouraged me from carrying on with my plans to move to East Africa. How did your life change after you were diagnosed? I think this is still something I am coming to grips with. At first there was a lot of adrenaline, “You can do anything!” But now I am becoming more accepting of being someone with a medical condition. I was someone for which “healthy” was a part of my identity, so learning how this fits [into my life] has been a huge struggle for me. As a fellow adventurer, I’m definitely curious about how you manage your diabetes on your travels. What are some things you have to adjust or take into consideration that you might not have to otherwise? In this part of the world, electricity and refrigeration are always an issue. We have a car-fridge for road-trips, which has been essential in the heat. I also try to bring Glucagon with me when we travel locally as you are pretty much on your own in terms of emergency medical care. Having to be self-sufficient and being prepared for the worst are probably always on my mind. I once heard of a 4-day traffic jam in Kenya recently, which got me thinking about always being prepared with supplies, snacks, and water. We connected through the online diabetes community. Can you share more about how this virtual support system has played a role in your diabetes self-care? It was on at the start of this year that I started a blog about my journey that I reached out to the community, until then I was fairly isolated in terms of a diabetes community. I wish so much that I had done so earlier. The moral support that this community gives me is so valuable in motivating myself to carry on, or to feel okay about being a bit down. It means so much. 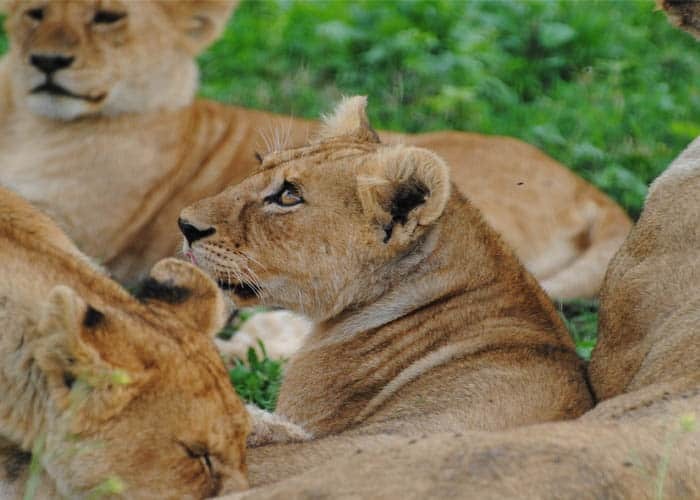 Your latest adventure sounds like quite the story: moving to Tanzania with your husband, a pilot. What led the two of you to that part of the world? We have always wanted to travel to Africa but not on a tour, so living here seemed like a way to make that happen. I had been teaching for a few years, and he was flying, so our work experience was perfect to get jobs in this part of the world. We chose one or two schools that I would be happy to work for, and then we applied and moved! It was a bit of a whirlwind, especially right after a type 1 diagnosis. We are still here, over 2 years on. The pilot/teacher life is a great combination for adventure! What’s been your favorite story about living in Tanzania so far? Hmmm, that’s a very difficult question! It’s really impossible to pick one. My favorite wildlife story is probably walking back to our tent one night, escorted by a Massai guide. We asked him if there were any animals in camp that night and he casually swung his torch [flashlight] to the left, showing a massive elephant munching away happily only 20 meters [about 65 feet] away! This was so normal for him that he hadn’t even thought to mention it. Otherwise, day-to-day life is full of stories, from power cuts to flooded roads…my most memorable moments will always be those times spent enjoying tea with locals in their homes, or playing games with the kids. It’s never boring and always challenging. Tell us a little bit about your involvement in organizations like T1International. I reached out to T1International as I think I offer a unique perspective as an “expatriate” type 1 living in a developing country. Living here made me realize what a safety net I had at my diagnosis, and what would have happened to me if I were Tanzanian. The consequences of a type 1 diagnosis here is most likely to be very dire, which seems so unfair [and determined] based on where you happen to be born. Have you been involved in the diabetes community in Tanzania? 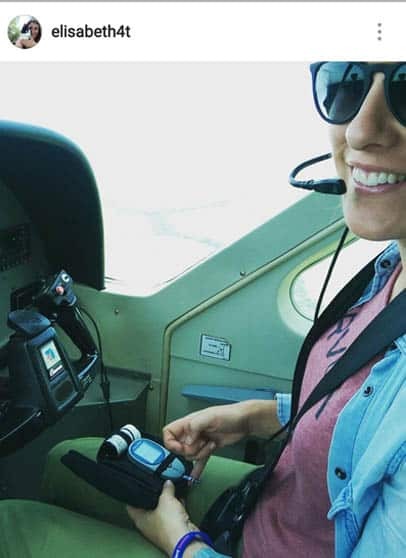 Pilot wife perks: BG checks while zipping around the Serengeti! Unfortunately I haven’t managed much here, I wish I had time to do more. I have only met one other [person with] type 1 here. We connected through T1International. It was a humbling experience and really special meeting someone from such a different world, yet we share such an intimate part of our lives. What are some ways people around the world can help people with diabetes that may not have access to the best healthcare options, in your experience? I think the main way we can help is through advocacy, raising our collective voices. I try to tell as many people as I can about my illness – people are always surprised that a privileged foreigner can have something like this happen to them, as there is a lot of stigma around diabetes here. Have you planned any adventures for 2017 yet? So much is happening – let’s get in touch next year. It will be exciting! For more about Elisabeth, check out her Instagram account (@elisabeth4t) and her blog, The 4 Ts. All photos in this article are courtesy of Elisabeth Fraser. Used with permission.